So, today, one of my Facebook friends shared this fun news report, which you may have seen, about Eclipse the Dog, who rides the bus like a person does. It was just the thing to perk up my morning. 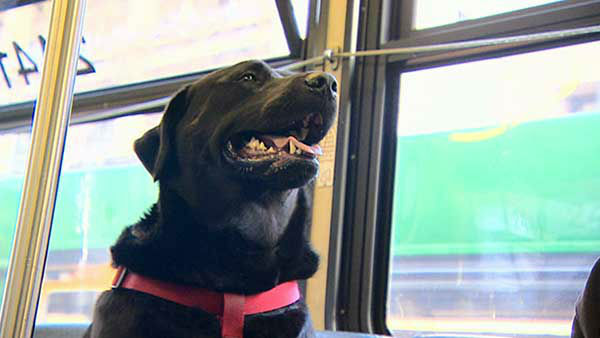 I had to watch the video a few times, because this dog is adorable and smart, and has better public transit manners than most riders of the Madison bus system. Apparently, it started when her owner took her out to catch the bus to the dog park and took a smoke break. When the bus came, Eclipse was tired of waiting and was so ready to get on with her day that she left her owner behind and took the bus herself, recognizing the stop at the dog park. Her owner, Jeff Young, said that “if we get separated, she gets on the bus without me and I catch up with her later” (Hayden, McRady). I’m no expert in psychology, it’s probably not that difficult to figure out why Eclipse does what she does. Ever since Pavlov, we’ve known that animals such as dogs can respond well to classical conditioning, which leads to recognizing patterns. What impresses me more is the spatial and geographical knowledge that this dog seems to possess. The variables of travel vary every day, and so many things could lead the dog astray. For example, the dog could be distracted by a small animal, someone on the bus could offer her a treat and cause her to miss her stop, or the bus could get caught in heavy traffic, prolonging the ride, making Eclipse get off a stop too early because she feels that she has spent enough time on the bus that day. The fact that she sits in a seat and allows people to pet her, potentially distracting her from her task, definitely puts her in the top percentile of non-human intelligence. I mean, think about it; she can’t see color, read words, or ask directions. That would be like putting me on a bus full of locals in Thailand without my glasses and telling me to get off at “the square with the big tree.” I would probably end up either in Cambodia or attempting to make conversation with local trees. Now that I’ve spent about an hour watching videos of animals on the Internet, here’s something I found about other animals who use public transportation. Spoiler alert: some of the stories don’t have happy endings 😦 but it does go to show you that maybe we’re underestimating what our animal friends can do. Oh, and today has been my first six-continent day of the year! Thank you so much for coming and visiting today: from North America – USA and Canada, South America – Venezuela and Chile, from Europe – Ireland/Germany/UK/Czech Republic/Cyprus/Austria/Turkey and Gibraltar (for the first time! ), from Africa – Kenya and Egypt, from Asia – Israel/Azerbaijan/Philippines/Kuwait/Bahrain/India/Taiwan/UAE/Jordan (for the first time! ), and Armenia (also for the first time! ), and from Oceania – New Zealand and Australia! Thanks for reading, come again soon! Lammle, Rob. “Public Transportation is for the Birds (And Dogs And Goats).” Mental Floss. 18 August 2010. http://mentalfloss.com/article/25504/public-transportation-birds-and-dogs-and-goats. McRady, Rachel. “Dog Rides Bus to Dog Park in Belltown, Seattle By Herself: Watch Eclipse’s Viral Journey!” Celebrity News. US News. 13 January 2015. http://www.usmagazine.com/celebrity-news/news/dog-rides-bus-dog-park-belltown-seattle-video-2015131.